LA Mayor Slow Jams A Freeway Closure [VIDEO] - Joe.My.God. 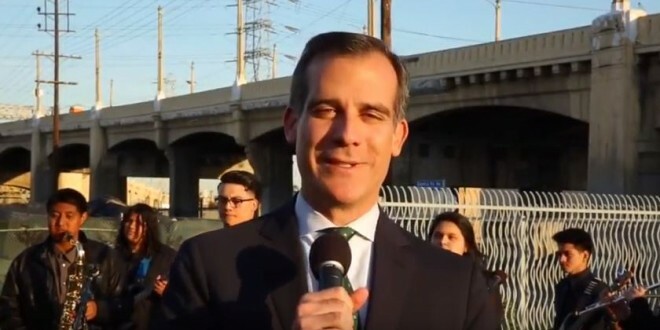 Garcetti recorded an R&B-style number, complete with music video, in an attempt to soften the news that the 101 freeway will shut for 40 hours. As factual as it is funky, depending on your tastes, the song contains lots of useful information about the closure. The freeway is being closed while the city demolishes the 6th Street Bridge. Backed by the local Theodore Roosevelt High School Jazz Band, Mr Garcetti sings: “See we’re bringing down the 6th Street Bridge, making way for something new and the demolition will cause delays. “But sometimes, just sometimes, you have to get your hands dirty to build something beautiful. “So on Friday night the 101 Freeway east of downtown will take a break for 40 hours of R&R … and R&B.” The music was an original score written and performed by the band, according to the LA Times.